Suicide is one of the most common causes of death in elderly people, with its prevalence ranging from 18 to 20% [4–6]. Additionally, most mental disorders are known to be associated with increased mortality because of suicide . However, there is a lack of understanding of suicide death among those with cognitive impairment such as dementia or MCI. Death by suicide is known to be infrequent in the advanced stages of cognitive impairment, but some reports have shown a higher risk of suicide during the early stages of cognitive impairment [8, 9] when their insight and the ability to plan suicide are intact. Although there are reports that show depressive symptoms are linked to suicide in patients with cognitive impairment [10–13], little is yet known about the relationship between cognitive impairment itself and suicide. 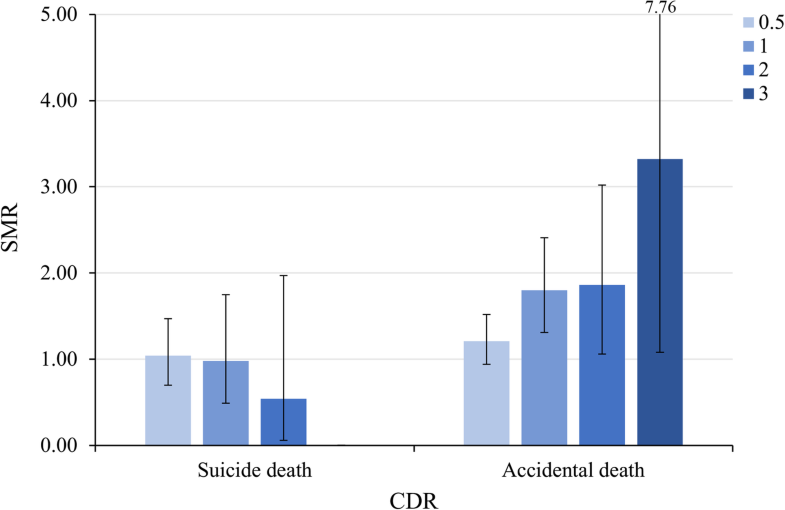 According to our study, the risk of suicide among patients with cognitive impairment did not increase significantly, which is consistent with the findings of most previous studies [27–29]. 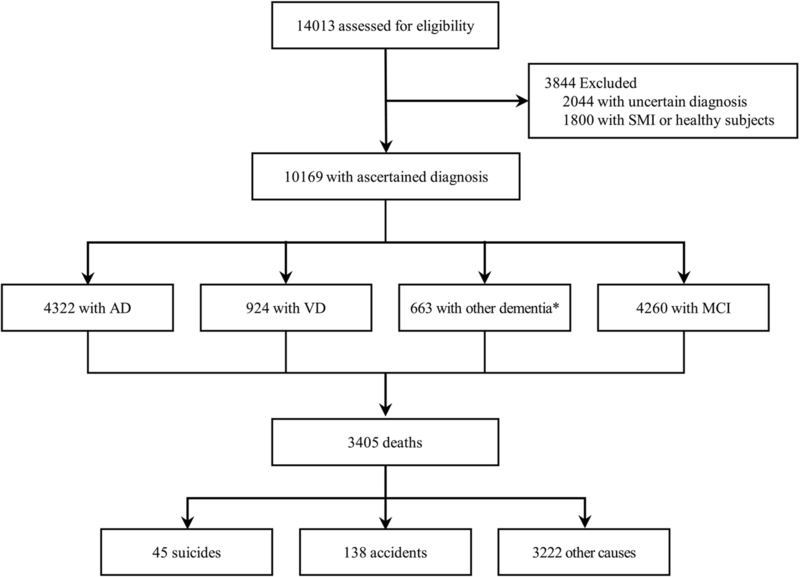 Even though there have been several efforts to predict the clinical factors of suicidal death in people with dementia, most participants were either psychiatric inpatients or had severe medical comorbidity [13, 30, 31], which made it difficult to ascertain the true risks of suicide itself in those with cognitive impairment. Furthermore, suicide in elderly patients with cognitive impairment did not demonstrate the usual risk factors for elderly suicide, such as the male gender or advancing age . 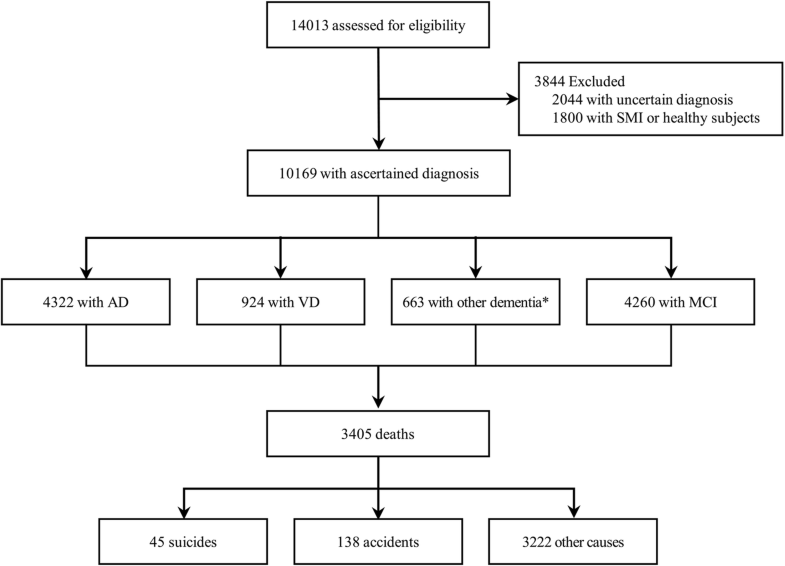 This suggests that the nature of suicide in elderly patients with cognitive impairment is somewhat different from the elderly without cognitive impairment.